If I put a bait on the screen, that octroks comes to it (as it should be). But if anything is between the bait and the octoroks, a tree, a stone or whatever, they can't find the way. And that even, if the bait is only two tiles away. It stays as seen on the screenshot: The right-sided octoroks stays on the right side of the tree and NEVER come to the bait. What can I do (except removing all barriers)? About all you can do is move the bush. Someone with more scripting knowledge might know a way, though. Pic 1: The enemies are anywhere. Pic 2: I put the bait on the screen and they come from wherever they were before. It all depends on pathing. ZC Enemy AI isn't that advanced. Remember that the screen layout is pretty much defining a 3D object, in a 2D space. That#s a tree, not a bush, and its intended scale is a depiction of a forest patch. 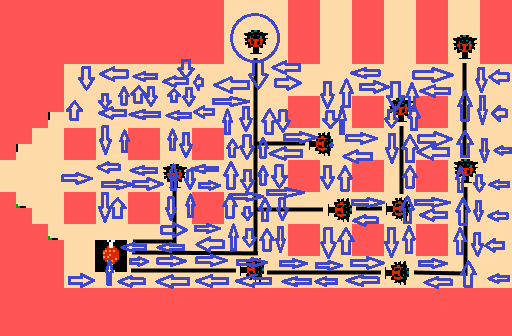 In ZC, even if the Octorock was attracted to the bait, it'd hit the solid combo, and change direction. It would be possible to write more advanced pathing as an npc script, but believe me, writing realistic pathing routines is absolute hell. You can try tinkering with both the enemy step speed, and the hunger value. One issue with high step, is that the read-ahead for a solidity check is at a greater distance. writing realistic pathing routines is absolute hell. What is the problem? The bait is anywhere and the enemies too (elsewhere). And between the enemies and the bait a tiles. Solids and others. Ok, a single fast way doesn't always exist, because it doesn't matter if the octrok for example goes down, left, left, left, down, left OR left, left, left down, left, down OR down, down, left, left, left, left... or whatever. The route is the goal. 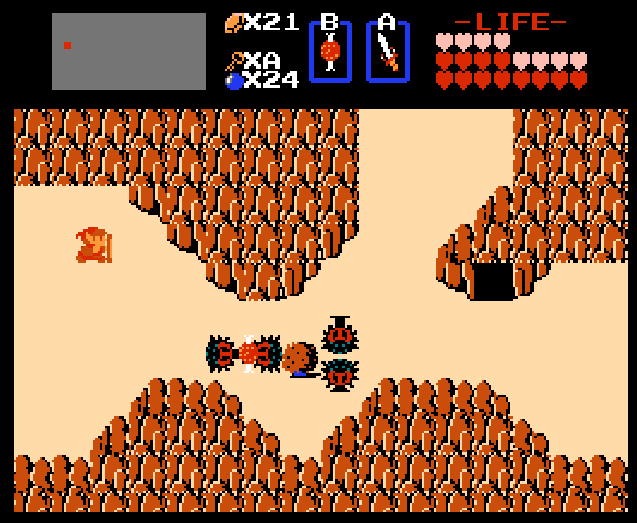 A magic octorok can kill you in a few seconds, but a tree between the octorok is a problem? 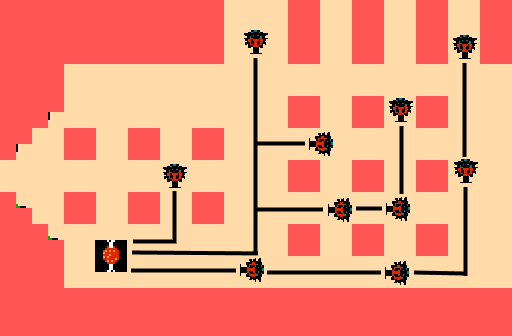 Proper pathfinding would be a lot of work, but randomly choosing between the vertical or horizontal direction when moving toward bait would be enough to mostly solve this simple case. I don't believe the NES version does anything like that, though. And a column of two or three trees could still be an issue. Last edited by Saffith; 12-31-2018 at 12:27 AM. That's an algorithm to resolve stuff like this, but it isn't perfect, and implementing it is a complex process. The command should be (and in the most causes it is so): There is a bait in the left corner. Find the fastest way and run like hell! The last picture is an extreme example with 15 solid combos. It should bei never a problem, but in my quest a single tree is the problem. OK! If it can't solved, it is so. Another question: What does "duration = 768" in the bait-item means? That means the bait will disappear after 768 frames, which is 12.8 seconds.